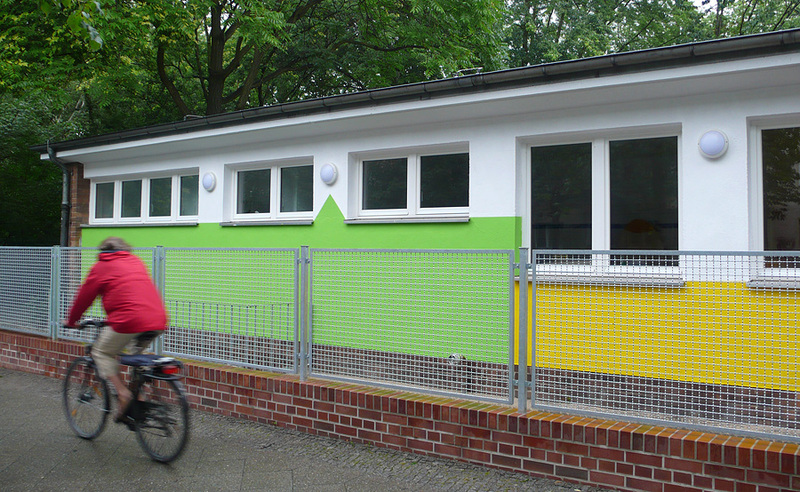 I’d intended to photograph the exterior wall of this Kindergarten on Baerwaldstraße some time ago, because it had been home – until very recently – to an exceedingly good black and white throw-up. But the wall’s been given a nice new coat of paint, and whoever was in charge of the brush and masking tape that day seems to have had a beautiful moment of lucidity. The inclusion of the superfluous green triangle, poised so delibarately beneath the lamp, was either an act of devine intention from the start, or the kind of inspired gesture which follows, and trancends, a mistake. Either way, I have found peace and sanctity in this triangle.